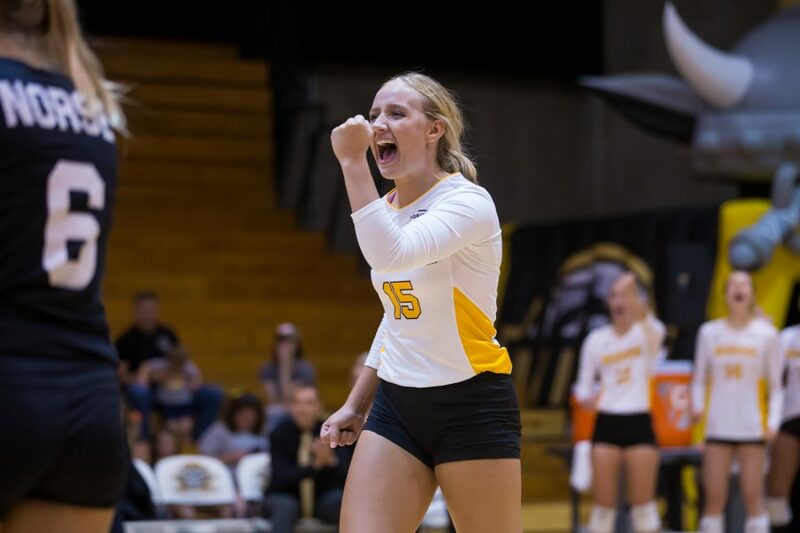 Friday night’s game resulted in a 3-0 win for the Norse against UIC with set scores of 25-22, 28-26 and 25-20. After tonight’s match, the Norse improve their record to 17-8 overall and 9-5 in Horizon League play. Haley Libs led the Norse with her 20th double-double of the season with 13 kills and 12 digs, while Aston Terrill broke NKU’s Division I era single season digs record by surpassing Mel Stewart’s (2015)record of 534 digs. Terrill ended the night with a combined 552 digs on the season after a 21 dig performance against the Flames. Shelby Olsen also etched her name into the Norse’s Division I era record book when she tied Jenna Schreiver’s (2012) six aces from the service line. Olsen finished the match with her 17th double-double of the season with 16 assists and 10 digs. The first set of the match started rough for the Norse as they trailed by as many as six points before they went on a 7-0 run. The Norse were within two points at 16-14 before the Flames took a timeout. After the timeout, Olsen nailed back-to-back aces, forcing the Flames to take another timeout. The Norse then went on another five point run bringing the score up to 23-19. Libs finished off the set with back-to-back kills. The second set was dominated by the Norse offense as they got a majority of their points from kills. Things started getting nerve wracking towards the end of the set when the Flames came back from a six point deficit. Laura Crawford saved two set points off of blocks before Anna Brinkmann tied the set 26-26. The set was ended after Western converted on a kill. The Norse took control of the final set after Libs went on a six-point serving run and continued to keep the pressure on the Flames throughout the entire set. The Norse ended the set with six aces and ten terminations. The Norse return home November 9 to face off against Oakland and will finish their season at home on November 10 to face off against Cleveland State. Friday’s game is slated to start at 6 p.m. while Saturday’s game is slated to start at 4 p.m. and will be broadcast on ESPN3. Saturday’s game is also Senior Day, so come out to support volleyball’s only Senior Haley Libs in her final regular season match as a Norse.